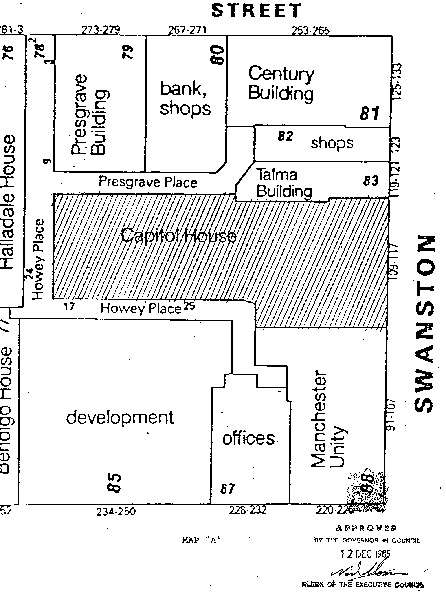 Capitol House, Swanston Street was built in 1921-24 to house a theatre and shops and a ten level office tower. It was designed by Walter Burley Griffin and his wife Marion Mahony, in association with Peck and Kemter, and incorporated Melbourne's first picture palace. Threatened with demolition in the 1960s, the building was retained, however it was extensively altered. 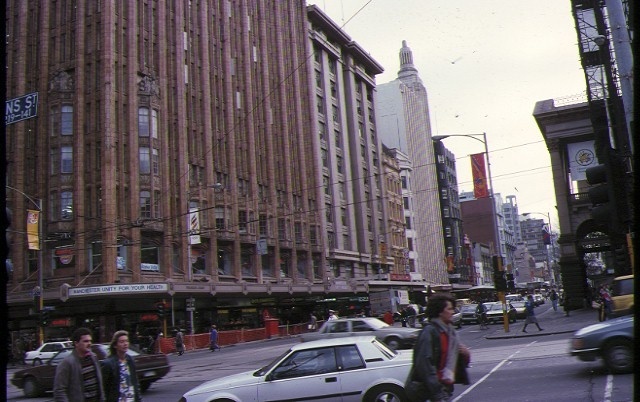 In the early 1920s, this block in Swanston Street was at the heart of the city retail trade. In 1921 it was purchased by two companies, headed by Greek community leader, philanthropist and restaurateur; A. J. J. Lucas; American entrepreneur and film expert, Herman E. Phillips, and Raynes Dickson. Lucas was instrumental in securing the services of Walter Burley Griffin who had already undertaken architectural work for him. Brought into the Capitol building company for his film knowledge, Phillips was one of the brothers responsible for Luna Park (1912, VHR H0938) and the Palais Theatre (1927 VHR H0947). Lucas and Phillips visited the United States and England to inspect the latest theatres and to purchase the necessary fittings, including an expensive Wurlitzer organ, one of only four in the world at the time. The main contracts for the building were let in 1921. Built of steel and reinforced concrete to the maximum permissible height of 132 feet (40.3 metres) by the principal builder, John Monash's Reinforced Concrete and Monier Pipe Construction Company, the building was technically advanced in its construction. The use of reinforced concrete enabled the complete elimination of internal columns to support the dress circle in the auditorium and also allowed construction of a daring cantilevered street verandah. Capitol House was designed to include more than one hundred offices, six shops, a large auditorium to seat more than two thousand people, and associated lobbies, lounges and staircases. The building was designed to be exposed on all sides, unlike most city buildings at the time. The highly modern Swanston Street facade incorporates vertical piers which extend the entire height of the building, capped by deep cornices and grouped in three to produce two pylon-like motifs. Revivalist themes are eliminated by the lack of detail on this facade. The Capitol Theatre opened in November 1924, displaying an auditorium designed to create pure fantasy. The main feature is the cave-like crystalline modelled plasterwork ceiling with concealed coloured lights which change systematically through a range of hues and brightness. Foyers were also cave-like with stepped, illuminated ceilings, decorated columns and interpenetrating voids. Paramount Pictures leased the Capitol Theatre until Hoyts took over the lease in 1940. The early 1960s saw the demise of a number of Melbourne's large cinemas and in 1963 Hoyts did not renew their lease on the Capitol Theatre. This resulted in proposals for demolition, or alteration, of the building and instigated a campaign for its rescue. A compromise resulted in the retention of the auditorium ceiling, but the destruction of the ground level foyer and stalls, due to the insertion of a new floor within the original auditorium. The main elements of the theatre, including the upper foyers and the front facade, remain substantially intact. Capitol House, Melbourne is of architectural, historical, aesthetic and scientific (technical) significance to the State of Victoria. 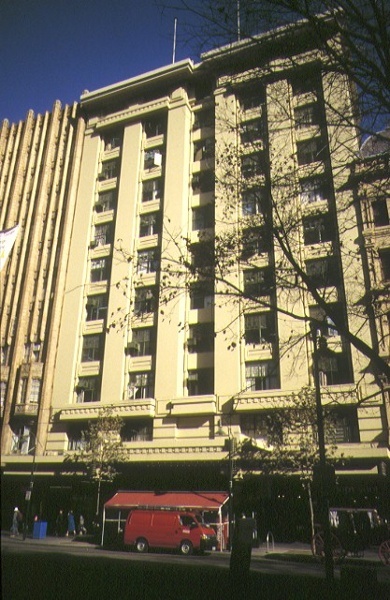 Capitol House, Melbourne is of architectural significance as a unique expression and highly advanced design concept by the creative and well known architects, Walter Burley Griffin and Marion Mahony. It is of significance as one of their greatest works and as their largest commercial building project. Capitol House, Melbourne is of architectural significance for its highly original combination of offices, shops and an entertainment venue in one building. Although not unique, it was an advanced concept at the time, developed on a major scale with the inclusion of a vast auditorium. Capitol House, Melbourne is of historical significance as the first of three great picture palaces built in Melbourne in the 1920s. Predating the Regent Theatre (VHR H0690) and the Forum Theatre (former State Theatre VHR H0438) by five years, it exposed Melburnians to a totally new phenomenon that was to become a fundamental part of popular culture. Capitol House, Melbourne is of historical significance as the focus of one of Melbourne's first conservation campaigns. This included support from the National Trust, the Royal Victorian Institute of Architects and architectural writer, Robin Boyd. Capitol House, Melbourne is of aesthetic significance for its foyers and auditorium interiors, which are extraordinary and were highly advanced in concept in the 1920s. The auditorium ceiling design, with its spectacular lighting effects, is of particular importance. Capitol House, Melbourne is of scientific (technical) significance for its highly innovative structural design which explored the limits of steel and concrete. 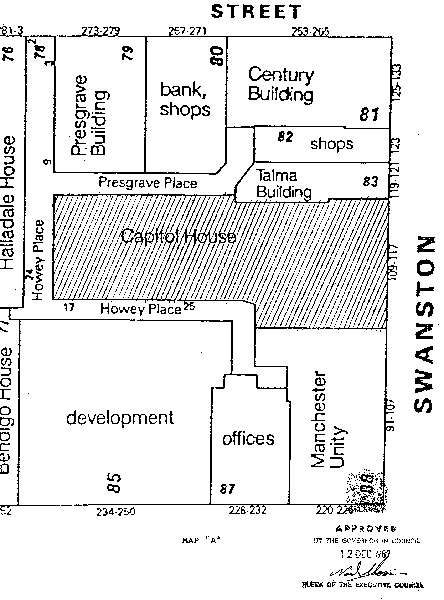 Capital (sic) House, 109-117 Swanston Street, Melbourne. The whole of the building and land shown hatched on the attached plan market (sic) "A" as described in Certificates of Title Volume 4678 Folio 493 and Volume 4678 Folio 433. Designed by Walter Burley Griffin and Marion Mahony and opened in 1924, this building contained a vast auditorium which was Melbourne's first picture palace. Its spectacular illuminated, modelled ceiling survived extensive alterations in the 1960s.